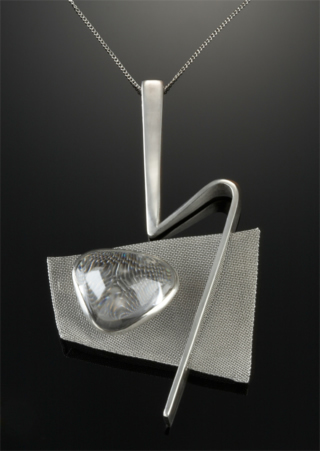 Pendant (sterling silver, stainless steel screen, quartz), 1950. "I can watch dinner cooking while I work," De Patta told the San Francisco News. She was a superb cook. De Patta, a focused artist, worked long hours on art and business. She kept meticulous records, recording each sale along with a sketch of the item. She also bartered jewelry, often for art. She acquired a Ruth Asawa sculpture that way, and exchanged jewelry for photos with Imogene Cunningham, a close friend. Other artist friends included jewelers Merry Renk and Florence Reznikoff, ceramicists Edith and Brian Heath, architect Raphael Soriano, and artist Giacomo Patri. 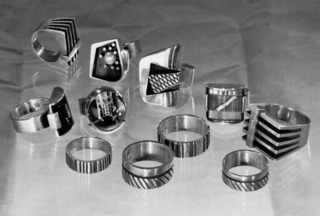 In 1951 she co-founded the Metal Arts Guild, an organization of jewelers that still exists today. De Patta, a "diminutive sculptress of small forms in silver and gold," as a San Francisco News reporter called her, was "rather quiet." Her friend Michael Elkin described her in Arts and Architecture in 1945 as "small, warm, completely surrounded by friends." "You would think she would have been very driven. No. Not at all. She loved to folk dance," says Martha Bielawski, who met De Patta in the mid-1940s and married Gene after De Patta's death. Martha remembers a woman who read literature, "Ulysses, all the classics of the time." De Patta owned a succession of dogs. Martha remembers a pair of dachshunds. Throughout her life De Patta would adopt new enthusiasms. "Have you tried ice skating yet?" she asked a reporter in 1940. "It's the most wonderful sensation in the world." "I have pictures of her going skiing in the early 1940s," Martha says. And by 1947, when De Patta and Gene Bielawski were teaching art at Oregon State, De Patta was figure skating—and teaching dance. De Patta was fascinated by science and technology, studying up on the use of steel in architecture, X-rays, stroboscopic photos, and plastics. At the World's Fair she enjoyed a demonstration of tire production and lectures on Polaroid photography and the cyclotron. De Patta was deeply interested in social issues, and hosted discussions in her San Francisco home in the mid-1940s with like-minded people, including Martha Bielawski. "We were all Communists back then," Martha says. In 1945 and '46, De Patta and Gene were teaching at the California Labor School in San Francisco, an institution known for practical teaching, renowned instructors, and leftist leanings. It was there she befriended architect Bob Anshen, who later convinced developer Joe Eichler to build architect-designed modern tract homes. Gene later taught at the public Gompers Trade School in the city, losing his job, Martha says, for refusing to sign a loyalty oath to the United States.